Parents: You can reach My Santa Call weekdays between 9a and 6p for business related matters. KIDS: PLEASE DO NOT CALL FOR SANTA AT THIS NUMBER. HE IS ALWAYS VERY BUSY IN HIS WORKSHOP CAN CAN NOT SPEAK TO CHILDREN RIGHT NOW. YOU CAN EMAIL HIM TO THE RIGHT USING THE ONLINE FORM. 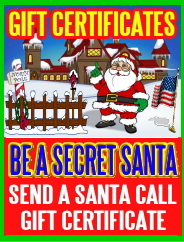 This year make it a Christmas to remember for your child with a LIVE Santa Call from Santa Claus. Your LIVE My Santa Call is recorded FREE in mp3, as a ever-lasting keepsake for you and your children, plus you enjoy a family Magical Web-page FREE. Your Live Santa Call also includes a free ‘private’ Santa’s Message Web Page featuring the recorded call “streaming online” in mp3. You can listen online, email friends and family, and download the MP3 as a keepsake forever. Calls are reserved on a first come – first served basis and times are limited so hurry and order today. -name of the call family. -type of call you requested. -why you are contacting us today. -good time to call you if required.